Wake up your dining room after a long winter with these colourful and patterned spring table napkins. Spring is my favourite time to freshen things up around the house. Pretty blooms, colourful textiles and other decorative accessories are quick and easy ways to breathe new life into a space after a long drawn out winter. Why can’t winter be shorter? Last week, I shared some beautiful spring decorating inspiration. 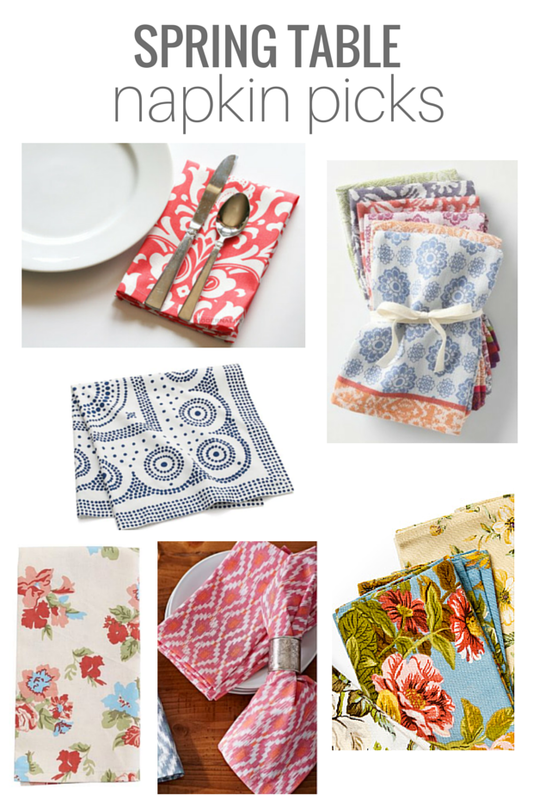 Today, I thought I’d show you some of my favourite bright and cheery napkin picks to liven up your spring table. They’re definitely instant colour gratification without costing a bunch. I love 10-minute decorating projects! *Some links are affiliates. Check out my blog policies. If you like to sew, napkins are easy to whip up (as another option). I plan on pulling out my machine later today to start on some using fabrics I’ve had in my stash for a while now. Chances are, you’ll see them in an upcoming post. Added any new spring decor to your space lately? Are textiles your thing too? What are you looking forward to most about the changing season?